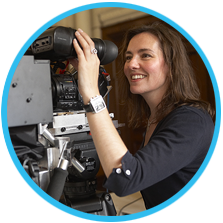 Tracey Larcombe is a short film, commercial, series and documentary maker who comes from a strong background in programme production for SKY & the BBC. With a track record for directing intelligent, eye-catching projects in a variety of genres, Tracey is a natural storyteller who enjoys communicating with an audience in an engaging and quirky way. Her short film, ‘Being Lionel’ starring Lionel Blair, received excellent reviews within the industry, and was selected for the IFS Festival in LA and for a ‘Women in Film & Television’ special screening event in September 2014. Writing/directing projects in development include feature screenplays ‘Mother in the Cupboard’ with David Baddiel, ‘Season To Taste – or How to Eat Your Husband’ with author Natalie Young, and TV sitcom ‘Back in the Game’. Tracey has directed over 30 episodes of BBC series ‘Doctors’, and is currently directing ‘Casualty’ for BBC1.